This deck is super exciting. The goal is the same as most Green decks: ramp out giant monsters as fast as possible. 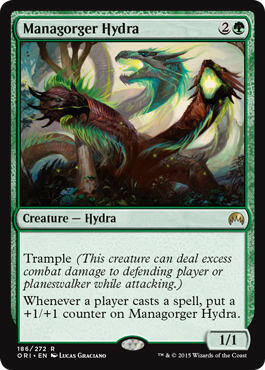 In this case, the premier monster is Managorger Hydra. If you can play that on the first turn, it’ll be gigantic when your opponent unloads their artifact mana and lets you apply quick pressure. Managorger Hydra is even great as the game goes on, since it gives you a kind of inevitability in board stalls against decks like Workshops. The other advantage of this deck is that you get to utilize Green Sun's Zenith. Green Sun's Zenith gives you consistent access to a wide variety of powerful Green creatures like Reclamation Sage and Scavenging Ooze. Ramunap Excavator and Titania, Protector of Argoth team up with Wasteland and Strip Mine to help you keep opponents off of key quantities of mana, particularly when combined with Reclamation Sage hitting various mana rocks. You even play Noble Hierarch over the likes of off-color Moxen and Sol Ring so that you can utilize Null Rod, breaking the symmetry of access to acceleration between you and your opponent. As far as keeping pace on cards with the Blue decks, you have Sylvan Library and Horizon Canopy to help with that. Sylvan Library is a great way to keep pace with Blue decks for a couple of turns while you try to get your opponent dead, while Horizon Canopy is great in conjunction with Ramunap Excavator and Titania, Protector of Argoth. If you’re looking for a budget way to get into Vintage, this deck has plenty of angles to attack from. You can punish opponents on axes ranging from land destruction and artifact mana denial to grinding out card advantage with Thragtusk and Titania to devouring graveyards with Scavenging Ooze. The presence of Green Sun's Zenith in your deck means that subtle changes to the sideboard and maindeck can have profound effects on games, which means that you can have a huge advantage if you can accurately predict what your opponents will play.